The Bigger Picture of Weight Gainers: Serious weight gain requires serious calories. However, those who need the extra calories most, often have the toughest time consuming enough of them. For many aspiring to be bigger, highly-active metabolisms, weaker appetites, and on-the-run lifestyles make consuming sufficient calories through whole foods alone a real challenge. With Serious Mass, you’ve got nothing to lose and lots to gain. We’ve consolidated over 1,250 calories, 50 grams of protein, 250-plus grams of carbohydrate, and 25 vitamins and minerals with added glutamine and creatine into every serving. It’s time to stop thinking small; get serious-Serious Mass. 1,250 calories per serving in water; 1,630 calories when made with low fat milk. 50 grams of protein from a combination of faster and slower digesting sources including Whey, Casein, and Egg. 250-plus grams of carbohydrate to support fueling of intense workouts and aid in the replenishment of glycogen stores  with NO ADDED SUGAR. Enhanced with Creatine, L-Glutamine and Glutamine Peptide, Choline, Inositol, PABA, and MCTs. 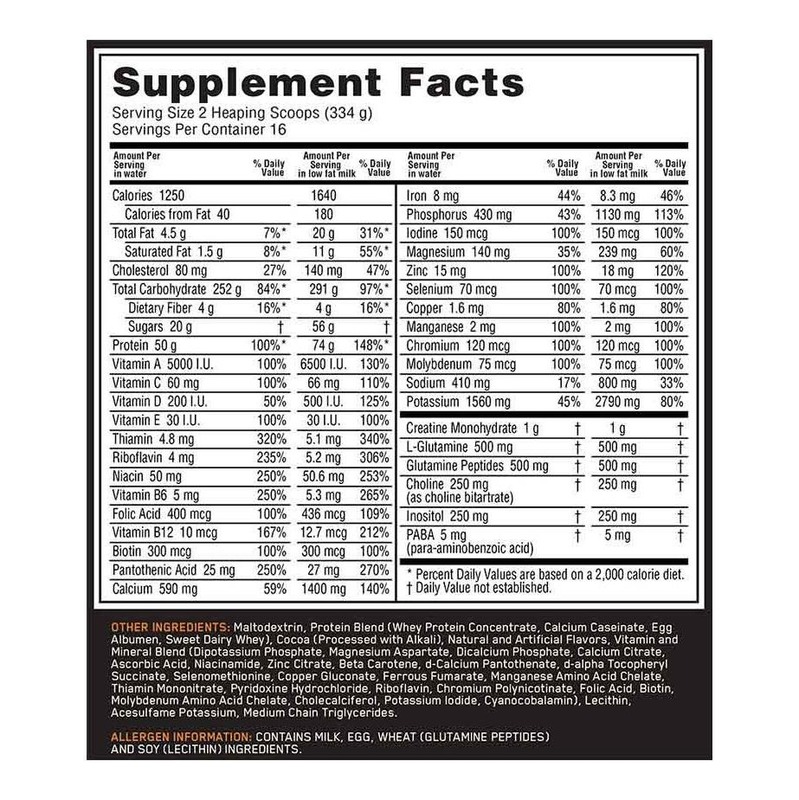 25 Vitamins and Essential Minerals with an emphasis on B-Vitamins and Antioxidants.